Take your 2005-2015 Tacoma to the next level with beautiful and fancy vinyl decals and graphics for your truck. You will be able to instantly garner looks from those around you when you have decals and graphics installed on your truck. You can grab a small decal that speaks volumes, or you can have your entire truck wrapped in a graphic to showcase your business. 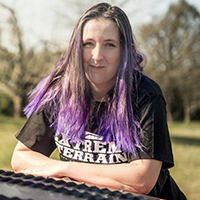 The choice is, yours to make and ExtremeTerrain is proud to be a part of it. We offer you some of the best options on the market and you will be able to customize and personalize your truck in no time at all. Depending on your unique style, you will find that our shop is packed with a number of options to include rocker decals, window decals, pin stripes, hash marks, and so much more. Each one of the graphics attaches directly to your truck and is made from the highest-grade vinyl so that it holds up to the weather elements outside. You will find that these vinyl graphics do not peel or wear down with time and they are meant to last for many years to come. Each vinyl has a protective clear coat on top of it that ensures that the edges do not peel up and that no one can damage the vinyl while you are away from your truck. The application process with these vinyl decals, stripes, and graphics has been modernized and you will find that the air release technology allows for a smooth and wrinkle-free application. Get some of the best vinyl graphics made from the highest-quality grade of vinyl here at the ExtremeTerrain online shop. Getting your truck in style has never been easier.